Our last dog was a boxer, but when she was put down I was so depressed, I had to have another dog fairly soon and after much research decided on greyhound adoption. I was very enthusiastic from the start and really looking forward to the process.. Fortunately, two 22 month old brothers became available and we took the plunge. What gentle, eager to please boys they turned out to be. My wife chose the names of Vladimir and Vitali after two of my favorite heavyweight champion boxers, brothers Vladimir and Vitali Klitschko. They love the car, are great on a leash and get along great (or in greyhound speak, greyt) with our numerous cats. All they ask….plenty of gentle love and attention. Based on their gentle nature and on my observations of other greyhounds at Greyhound Pets Of America (Cape Girardeau chapter) “meet and greets”, I will never consider another breed of dog. If anything happens to either “Vlad” or “Tally”, we will definitely get another greyhound. They are so gentle, eager to please and so very, very little trouble. Greyhound gets into your blood. I have owned several breeds of dog but with greyhounds, I am truly hooked. Greyhounds are graceful, gentle hounds. They are intelligent,inquisitive, quick to learn and make excellent loyal companions. 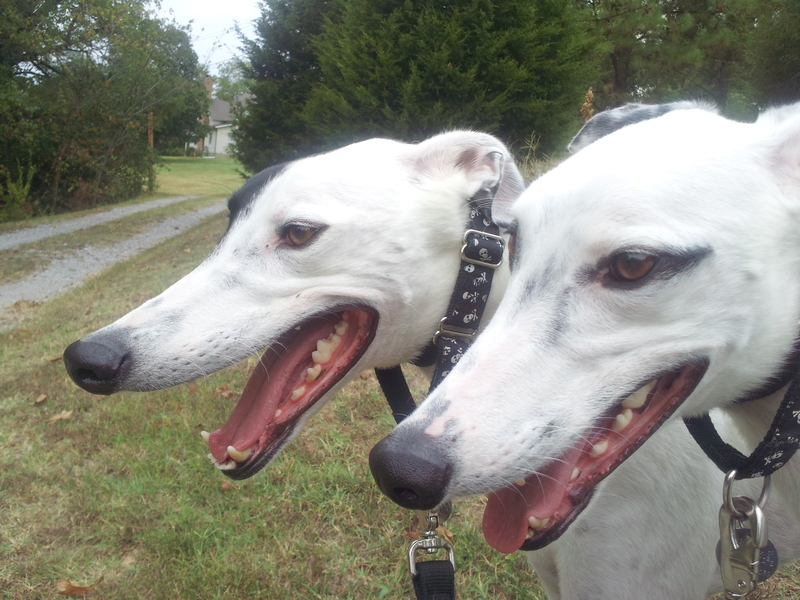 Contrary to popular belief they do not need excessive exercise, two twenty minutes walks will do, but if they are young, like our two boys, you will want to take them to a fenced area once or twice a week so they can do what greyhounds do, and that is to run. This is something beautiful to behold, if you have never seen a greyhound running full out, just for the pure fun of running, you are missing out on one of the great natural wonders of the animal world! Many of these wonderful dogs have had a bad start to life and deserve to be pampered, cared for and loved. Taking a walk with a greyhound is like walking with a celebrity, you can’t go far before someone stops you to talk about your hound or talk about their own. The adoption of our two Greyhounds has been one of the most rewarding experiences of our lives. ALL absolutely true!!! I have never had a dog that so completely took me over as my first Grey!! I will be heartbroken when I lose him. But, I know I will adopt another one because they do truly get in your blood!! Love the comment about walking them is like walking a celebrity! So true!! When anybody sees Missileman, they either stand and stare, then smile, or they approach us to ask if they can pet him. Most of them say that they’ve only seen pictures of Greyhounds and then talk about how beautiful he is and how graceful. More often than not, someone tells me he looks like a deer. I do love my boy!! This brings tears to my eyes – a storybook adoption with brothers being adopted together! Thanks Robin for helping to make it happen!